Universal Unique Trollbeads: Are they still controversial? This past July saw the introduction of the Universal Unique Trollbeads. I was fortunate to be at the Las Vegas Jewelry Show where they were debuted in the U.S. and where I saw the Universal Unique beads for the first time.The Universal Uniques or U.U. 's are created with a larger core enabling them to be used on Pandora and Chamilia chains. At the show I was able to hand chose the bead kits while keeping my customers and my Trollbeads Fest, which at this point was still in the future, in mind. This new introduction from Trollbeads was monumental and even more so than perhaps expected. After this exquisite release it was to my surprise many forums the world over had the buzz going and there were many long time collectors that were not happy with this new introduction. One collector said Trollbeads had sold out. Sold out? WHAT is that supposed to mean? Honestly I couldn't understand that opinion. Yes they were altering one part of the line but they would be still be making the standard classic size core Uniques. 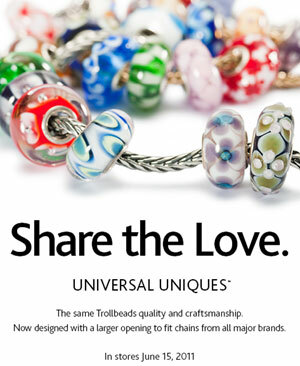 Why should they not change or alter something to allow other chain brand collectors to wear Trollbeads? How is that selling out? What they did was undo what Pandora and Chamilia had done to keep Trollbeads off their chains. Trollbeads has created a larger core to fit over the larger element that Pandora had implemented to keep the Trollbeads from being used on their chains and then Chamilia copied Pandora. Remember Trollbeads was the first on the market and Pandora created the same add-a-bead concept but with an end element was designed so it was too large for Trollbeads to fit over. The change that occured within Trollbeads isn't selling out, it is exactly as Lise Aagaard made the decision for, it is simply to share the beauty. 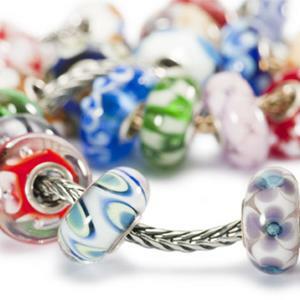 As you are reading a Trollbeads blog you may not have ever seen the Pandora glass beads. They are limited in number, are not creative, they don't vary and they certainly don't have uniques. Plus they have a huge flange of silver with "Pandora" stamped around it which design wise is too obviously a commercial branding effort. Is this necessary on personal jewelry? The reason is Pandora is not managed or owned by artists as Trollbeads is so the outcome of product is a direct result and always has been. What Lise saw and what she understood is something so sensitive and so practical no one in the Pandora frame of mind could comprehend it. Lise understood that Pandora chains are often given to a woman as a gift from her husband or from her children and she knows many woman don't want to replace what was a special gift. Lise also understood the financial aspect. Even if Pandora wearers love the Trollbeads glass beads it could be a financial issue for them to decide to start all over. So the decision was made to offer the most beautiful glass beads on the market to everyone so all can enjoy them. It was a generous move. Do you know that many of the Unique Trollbeads are made by Tibetans living in India in diaspora? The Aagaard's have been instumental in training these people and paying fairly for 6 years and stay in close contact with new training and techniques. This is just one community the Aargaard's have been aiding in making self reliance through housing, training and by building them the state of the art, well vented studios for them to use to create the unique beads. Trollbeads has recreated a win-win situation and I don't, for one, understand the controversy over the Universal Beads especially now when we have all seen how beautiful each one is and everyone has seen this too from new collectors to the old collectors. Come to think of it I think whatever created the buzz has dissolved and the buzz has turned into a purr. 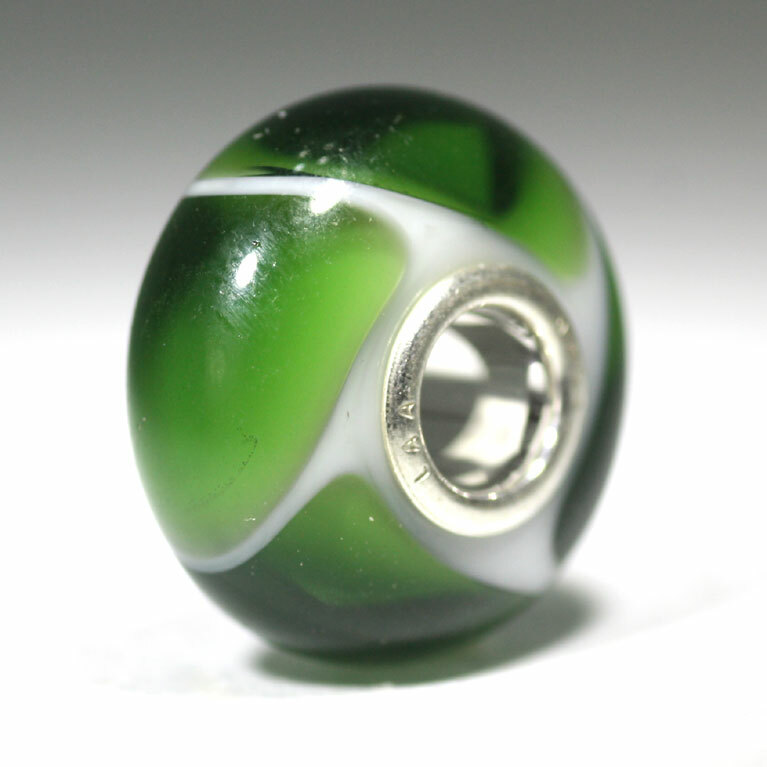 The Green Armadillo shown here is a beauty of a Universal Unique bead and a great example of the quality coming from Trollbeads. Today the venerable interchangeable bead pioneers released a new kind of Unique beads, Universal Uniques. The only thing that separates these from the original Unique Trollbeads is the size of the silver core at the center of the bead. As the original bead line Trollbeads set the course for all other lines and the lines that followed them developed their products so anyone with Trollbeads could not use their chains. With Pandora the end is larger allowing it only to accept its own beads that have large cores. Chamelia came out years later and they use the same closure, not allowing Trollbeads to be used on their chain. I have to explain that many Trollbeads collectors know Trollbeads are the original bead brand and are questioning this move to modify on Trollbeads part. I too was conflicted but now that I've learned the "why's" I understand and support this decision. Universal Uniques are a meant to be, in Lise Aagaard's exact words, "a migration tool" for other bracelet wearers to be able to add our beautiful glass to their bracelets. There are so many other people with other bracelets who have yearned for the Trollbeads product, especially the glass beads. So Lise's idea was to make something for them without impinging on Trollbeads or forcing the other collectors to go without. Having been a retailer for Trollbeads for years now I have seen many people who wear Pandora look longingly into our cases full of colorful glass beads, discussing the desire to have them but are simply not able to change the chain they wear. (The glass beads from Pandora are very limited and they have a visually intrusive silver band running on the side of the bead and attached to the core with PANDORA all over it.) When you consider the collectable beads are often gifts from husbands and children (mother’s day being our biggest holiday) the Pandora or Chamelia wearer’s may want to add more color to their bracelets but they don't want to offend the gift giver. Or maybe it's the cost of starting over but whatever the reason the Universal Uniques will stretch and break the boundaries laid down by the subsequent bead brands. No other bead brand has the history and experience of creating and offering glass beads like Trollbeads and this seems the best way to accomplish sharing of the beads! The Aagaard's are inclusive by nature and want all people from all communities to be able to try Trollbeads while keeping the integrity of the Trollbeads Mantra... excellence is craftsmanship, materials and design. On Trollbeads Gallery Forum there is an on-going discussion by collectors on the pros and cons of this decision and both sides have valuable merits and you may want to read this discussion. Please join the forum for the most up to date Troll beads information. This isn’t the first time Troll has offered the larger cores. In both of the charitable collections one being the breast cancer awareness beads and the beads created to raise funds for Haiti’s earthquake survivors both used the larger core so all collectors could take part in the fund raising efforts. My personal experience in seeing the Universal Uniques for the first time was overwhelming and if you know me and my history with Unique beads I have always offered them and I am not easily overwhelmed. Just last week at the jewelry show in Las Vegas dealers were given the opportunity to select their own sets from large bowls filled to the brim with some of the most glorious beads I have ever seen. Having only met Isabel Aagaard prior to this show I was excited to meet Lise and the rest of the family. I was also beyond excited about the new beads. For a week prior to the show I kept on imagining myself rushing right past Peter and Lise, the two people I have been dying to meet for years, to dive into the Uniques! Well it just about played out exactly as I imagined but I did it with a smile. My son was the first in the booth and had already pulled his selections for Starfish, the Trollbead store in Boulder, Colorado- so I was the natural second. I want to finish by reporting after my first day of sales they are being met with strong enthusiasm and so far my collectors have been all Trollbead collectors! From l to r:Peter,Isabel,Lise Aagaard,Krista,Louise Rogers,Robin A, Alex Rogers and Nicolas Aagaard at Las Vegas party!